Wizard And Minion Idle is an awesome idle clicker RPG developed by Oninou. Train your stats, cast spells, feed your minion, defeat monsters and bosses, raise demons, craft gems, go fishing and more. You will build your physical and sorcerous powers, weave game altering spells, and defeat fearsome enemies. Nourish your minion well, for your paths are intertwined. Your works in the mystic world will attract the attention of demons. Assign these demons based on your current in-game needs: power, gold, magic and more. An intuitive gathering and crafting system allows you to further customize your wizard for the challenges ahead. Rent structures, build golden plazas, drink from powerful elixirs to help you tarry on when sight of the goal is lost. Harvest experience points and soul shards to upgrade your wizard, allowing you to become the stuff of legends. If you get stuck in the game, check out the video walkthrough and gameplay for the game. 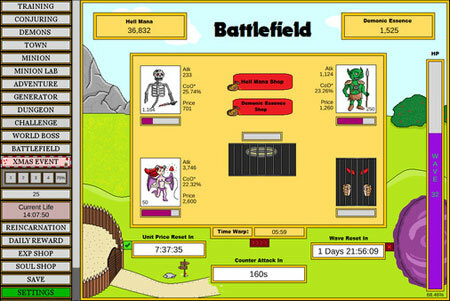 This entry was posted in PC Games, Walkthrough and tagged Wizard And Minion Idle Cheats, Wizard And Minion Idle Gameplay, Wizard And Minion Idle Guide, Wizard And Minion Idle Strategy, Wizard And Minion Idle Walkthrough by Marvin. Bookmark the permalink.